As a follow-up to my review of two Hilde Soliani fragrances, Una Tira l'Altra and Conaffetto, I've been sampling two more offerings from this line: Sweet Home and Il Tempo delle Mele. Both are gourmand perfumes, and both were inspired by specific chefs and dishes that left lasting impressions on Soliani's palate and nose. Sweet Home is an olfactory tribute to a dessert Soliani enjoyed at Lido 84, Riccaro Camanini's restaurant overlooking Lake Garda in northern Italy. It includes notes of chestnuts, sugar and vanilla. Sweet Home is sweet indeed, but not in a predictable way. It opens with a surprising note of warm, salted butter with hints of dough underneath, like a freshly glazed crust about to enter the oven. The sugary notes emerge at a leisurely pace and very gradually turn Sweet Home into a soft, clinging blend of vanilla bean and slightly nutty cocoa powder with excellent staying power. Unlike the buttery opening, which has a bigger presence, the rest of the fragrance stays fairly close to the skin. It doesn't give me a strong impression of chestnuts, but then again, I'm only familiar with roasted chestnuts; maybe I should try Soliani's Castagna Salata next? Il Tempo delle Mele ("the time of apples"?) is dedicated to Igles Corelli, chef at the Tuscan restaurant Atman, and to torta di mele ferrarese, a traditional dessert from the Emilia Romagna region. Based on what I've read about this homey-looking apple cake, Il Tempe delle Mele is an appropriate tribute. It includes notes of apple, milk and vanilla, starting with the apple: the fruit is juicy and just-cut, with a slight "bite." I don't normally like wearing perfumes with detectable apple notes, but this one feels natural and non-cloying. In any case, it's just the prelude to the vanillic-lactonic heart of the perfume, which has the scent and airy "texture" of freshly whipped cream. Hungry yet? I enjoyed wearing both fragrances and I'll be using up my sample vials. They're surprisingly wearable for perfumes inspired directly by desserts. They're a must-try for gourmand-lovers, but they definitely avoid "cupcake" sugar-musk territory, so if you're undecided about sweet scents, you may want to give them a sniff too. 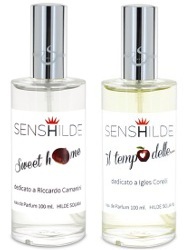 Hilde Soliani Sweet Home and Il Tempo delle Mele are available at Luckyscent, $160 each for 100 ml Eau de Parfum. These both sound really nice. Will put them on my list of samples to get from Luckyscent when I eventually buy Keiko Mecheri Loukhoum Parfum du Soir. Ooh, KM Loukhoum — one of my first full-bottle niche purchases!! If you love the powdery sweetness of Loukhoum, then you can definitely handle the confectionary/dessert aspects of this Soliani fragrances! Yes, I’m definitely craving some good desserts now! I’m tempted to stop at a bakery on my way home..
Did you? And if so, what did you buy? A baguette and a chocolate-almond croissant from the local French-owned bakery!! The opening of Sweet Home smells just like cream cheese frosting to me! Thanks for the review. You’re welcome! I”m so glad I”m finally trying this line. Thanks for the reviews, Jessica. I love sweet fragrances — they can elicit feelings of comfort or joy or bliss. I can’t stand the sugary musk that overwhlems so many offerings from Escada, Victoria’s Secret, and many celebuscents. It makes them all smell the same to me, and not in a good way. So, it’s nice to know that you didn’t detect that musk in these perfumes. Kindcrow, sometimes the right gourmand scent can really provide a sense of comfort! but not the sugary cupcake musks for me, either.